"The Future of music is about to be turned on its head, are you ready? ", Avril Lavigne's former manager Terry McBride, January 2009. 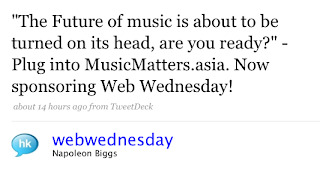 What a great opening line on the Music Matters 2009 website! In it's fourth year now, this conference for the music industry will be addressing the controversial issues, challenges and opportunities facing the music business today. Topics covered in the jam-packed three day event (2-4 June 2009) taking place at the Grand Hyatt Hotel in Wanchai include "Monetising Social Networks" and "From Content to Context - the Future of Music Composition and Performance". Branded Asia, the company behind Music Matters, have yet again managed to attract a list of star speakers from the global and local music communities, including the founders of China's two leading music websites - Allen Guo, CEO of China's Yobo.com and Gary Chen, CEO of Orca Digital which runs top100.cn. (Download the full programme here). Inviting Gary Chen, CEO of Top100.cn to speak at our 25th Social Mixer on 3rd June 2009. Gary will be giving us the insight into why Google has teamed up with his music search engine and is now positioned as "Google's Exclusive Partner for Chinese Music" (Google中国音乐服务独家运营商). 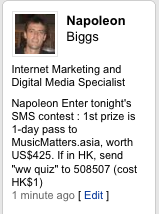 All Thing's Digital and PaidContent both have good articles covering Google's strategy, namely catch up with Baidu! 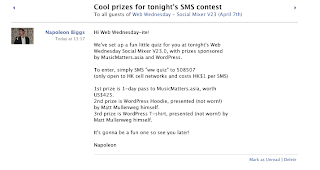 And if you're feeling really social, then you can join the Music Matters Group on Facebook.